Calling All Doctors! Come join our Team. Welcome to our website – take a look and see what we are all about! Our hospitals are 24 hour, AAHA Accredited Referral hospitals. We are Fear Free and Cat Friendly practices. In 2018, we completed a new 11,000 square foot building for our North Phoenix hospital. 1st Pet Mesa was the 2016 Veterinary Economics Hospital of the Year. Chandler was remodeled in 2017. We are experiencing rapid growth, have low staff turnover, and a great Team to work with! Many of our doctors and staff have been with us for 10 years or more. 1st Pet Veterinary Centers has made the decision to not sell to a corporation – we are and will remain independent of “Mars Bars” and all their clones. Instead we are pursuing the path of Team Ownership and an Ownership Culture. This is a great opportunity for veterinarians interested in joining a truly unique and awesome practice. We focus on providing the absolute best patient care and client service. Job satisfaction comes from working in a collaborative environment with the tools you need to take great care of your patients and clients. We have a truly stellar technical staff. As a team doctor, working with knowledgeable and highly skilled technicians makes your job easier and more enjoyable. All technicians are required to complete rigorous inhouse CE monthly. For more challenging cases, you will appreciate the availability of our Internal Medicine, Critical Care, and Surgery specialists for consultation or referral. Even on nights and weekends, they are just a phone call away when you need advice and assistance. You will be encouraged and trained to practice the best medicine possible. Monthly in-house continuing education services are available – including presentations, journal clubs, and M&M rounds. We are always looking for ways to be better than ever. If you have an idea that would improve patient care or make clients even happier, we want to know about it! Why not work with the best team in veterinary medicine? Benefits include a generous CE allowance for national meetings, liability & health insurance, paid vacation, 401K retirement plan, and a competitive salary or production. Although experience is an added bonus, what we are really interested in are doctors who have a passion for practicing the highest caliber medicine, play well with others, and understand the value of client communication and service. We are growing rapidly and need more Clinicians for all 3 locations: Emergency, Primary Care and Specialists in Surgery and Internal Medicine. We would be very interested in adding another Criticalist who has a strong interest in Surgery. We also desire to bring in other Specialties into our hospitals. Most emergency doctors work between 10 – 12 shifts per month (an average of 36 hours/week). For more information or to apply for a position, please send a cover letter and resume to drreniker@1stpetvet.com for immediate consideration. 1st Pet Veterinary Centers is offering a rotating internship with a focus in emergency and critical care. We are interested in helping you attain your veterinary goals, whatever they may be. Throughout the year, the intern will work with experienced emergency doctors, general practitioners, and specialists. The mentors providing support for the program enjoy training interns and encouraging their growth. As a team doctor you will enjoy working with knowledgeable and highly skilled technicians, having all of your radiographs read by Radiologists, and access to state of the art equipment (including full in-house laboratory, 8 slice CT scan, ultrasound, endoscopy, enteral and parenteral nutrition, advanced analgesia, and mechanical ventilation). Interns will experience a diverse caseload, and have both direct and indirect case management, including opportunities for emergency and general practice surgery. Experienced emergency doctors and specialists will provide assistance and advice whenever the intern is scheduled for primary emergency duty. Interns will rotate through the emergency & critical care (26 wks), general practice (6 wks), internal medicine (6 wks), and surgery services (6 wks). They will also have 7 weeks of additional out-rotations with boarded specialists off-site. Options for out-rotations include ophthalmology, oncology, humane society, neurology, anesthesia, dentistry, cardiology, and dermatology. Interns will rotate through all three locations: Chandler, North Valley, and Mesa. Successful candidates will have a passion for learning, teaching and practicing the highest caliber medicine, play well with others, and understand the value of client communication and service. A demonstration of a desire to learn emergency medicine & pathophysiology, a compelling personal statement, academic record, phone interview, and letters of recommendation attesting to excellent work ethic will be used for ranking and selection. Applicants are typically taken once yearly thru the match (see www.virmp.org), however, exceptional candidates may be considered at other times. For more information, email drreniker@1stpetvet.com for more information. Full and part time positions available. Job responsibilities include, but are not limited to: triage, high level nursing care, performance of in-house laboratory testing, monitoring patients under anesthesia, charting, and working together well as a team! The ideal candidate can function well in a fast-paced environment with good organizational and communication skills. CVT’s or VTS preferred. Experienced assistants will be considered for some positions. We are proactive at helping our team learn and grow! Salary DOE, and benefits include medical/vision/dental insurance, paid PTO/vacation, CE allowance, uniforms provided, and much more! If you would like to be part of a team where to you can truly feel like a working family, keep growing and learning, allowing for professional growth and personal fulfillment, providing a high level of care with progressive and modern medicine practices, then you are the right candidate for our team! 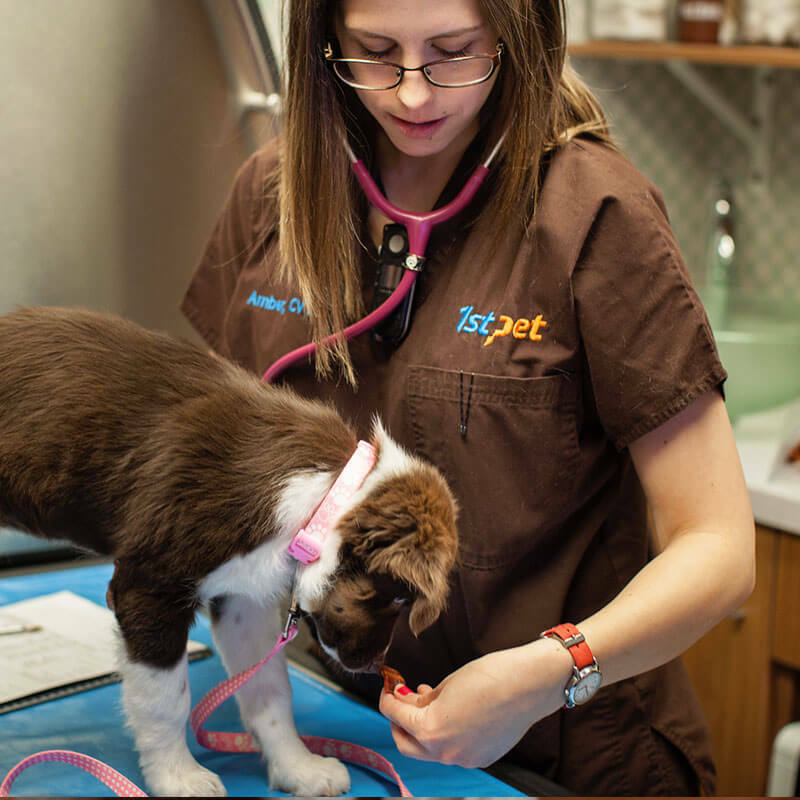 Please send a cover letter and resume to careers@1stpetvet.com for immediate consideration. Both part-time and full-time positions are possible. Schedule flexibility is a must! Shifts are evenings during the week, and on weekends. 1st Pet is a drug free workplace and offers competitive hourly wages, health insurance, uniforms, and more! Salary is DOE.